As a kid in elementary school, I remember a special event that only happened about once a year. Our class would line up, head down the halls, and into the gymnasium where the “star globe” would be set up in all its glory. The star globe was a big, inflatable, silver dome that, once filled with air, could be crawled into (it was rather big). My fellow classmates and I, upon going inside, could see only darkness. That is, until the rotating fixture in the middle was turned on. Then, we were able to see, much to our wonderment, lights and constellations filling the ceiling, rotating slowly about us. At the time, I took for granted the knowledge and beauty that such a contraption provided – I saw this merely as an opportunity to escape our everyday work. Today, I have come to appreciate “the final frontier” and the phenomenon it holds, believing that our existence among the infinite mass of stars is incredibly special. 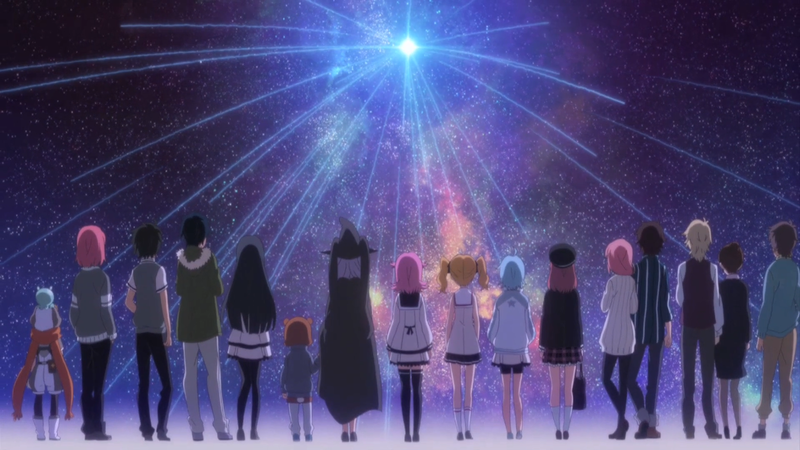 Houkago no Pleiades will definitely make you wish upon the stars for something: for it to end as quickly as possible. Houkago no Pleiades stars (pun intended) Subaru, a young girl who is fascinated by the field of astronomy. One night, she witnesses a brightly shining star, causing her, Aoi, Nanako, Itsuki, and Hikaru to gain magical powers. The purpose: to aid a little alien in collecting his engine fragments, so he and his people can travel once more. The title of an anime is more important than people might realize. Many shows simply describe exactly what will be found beyond the words, while others manage to be a clever twist that symbolizes a specific aspect. Regardless of its design, the title for a show becomes the “face” of the anime, used to distinguish it from its brethren and to allow people to understand what it will offer. So, in this instance, what does “Wish Upon the Pleiades” describe about the show and its overall goals? The key part is knowing what a “Pleiades” is or, more correctly, what the Pleiades is. The Pleiades is a set of stars that is distinct for two reasons: its brightness and its namesake. The former has allowed it to be viewed by people all over the world, creating various interpretations and connotations depending on the environment in which it is viewed from. In this sense, it is an entity that connects people together despite the cultural differences that exist. Houkago no Pleiades attempts to explore this idea, but it does so in as minimal a way as possible. 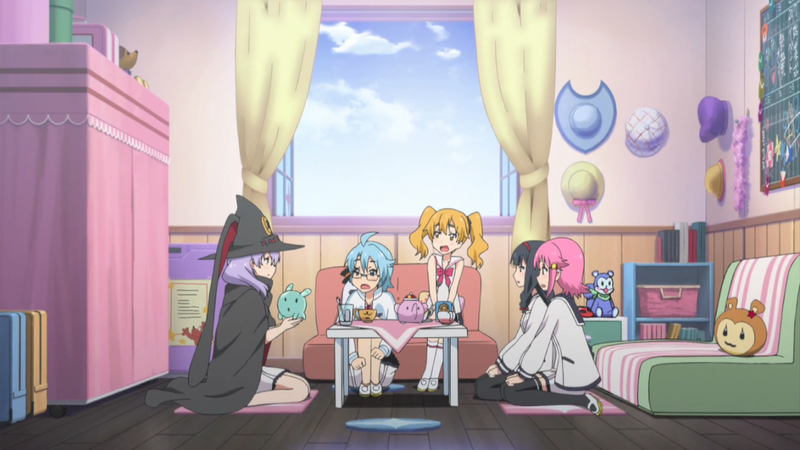 The anime introduces the concept of interconnected destinies, the “threads of fate” that cross, weave, and bend in separate and in unison patterns, but at the end only, not throughout the experience. It comes in the form of a single scene and exchange of dialogue, as a literal last-minute attempt to unify the events held prior to it. It is lazy because the show is trying to give its narrative meaning where there had been none previously. Now, the anime did have some setup in the form of the group of magical girls. They were from different walks of life, raised in different families, and had different wisdom placed on them, but the anime never expounds on the connections between the group, instead focusing on the individual. This is evident by the show’s tendency to have entire episodes dedicated to a single character. Even if the final, weak push for a coherent theme is accepted, it is astonishingly and immediately undone. The show concludes by essentially resetting everything to the beginning, as if what transpired actually never had. That means that the theme of connections is lost because they ultimately never existed in the first place. The show tries to say that the ways in which the girls’ journey has affected them will remain after their lives are put back to normal, but it is clear that this is not the case. They are completely different people who know nothing of each other or the time they spent together, destroying any semblance of theme it might have maintained. Besides the brightness, the Pleiades cluster is also known for its mythological origins. Deriving from Greek legend, Pleione gave birth to seven daughters, known as the seven divine sisters. Considering the cosmic relation of the show and the use of magical (divine) girls as the protagonists, this seems quite relevant to the show’s intentions. Yet, once again, there is a problem: there are not seven sisters (“sister” in this context means “strong bonding”) but five. To be fair, the anime might have extended the logic to include Pleiadaian (the alien) and Minato (the antagonist) into the total. However this does not work, not because one is from another universe and the other is genetically male, but because the anime spends so much effort on reenacting the same set of events. Instead of giving ample time to understand Pleiadaian and Minato, the show constantly has the girls: undergo trouble, chase after a piece of the fragment, and then fight a pointless battle against the villain. Such repetition causes Pleiadian and Minato to feel not like “one of the gang” but instead as outliers – which, coincidentally, continues to go against the theme of connecting with others since these two are effectively ignored. In truth, Minato eventually receives attention, but repetition gives way to convolution when his position is finally given an explanation. The show injects a new idea about latent potentials in people, but like the threads of fate such a motif comes out of nowhere and is not used to benefit or drive the narrative forward. It is simply a glaring flaw that hurts the anime altogether. In stunning fashion, one does not even have to go beyond Houkago no Pleiades’ title to realize just how broken the show truly is. By far the show’s strongest facet is the art and animation that it boasts. 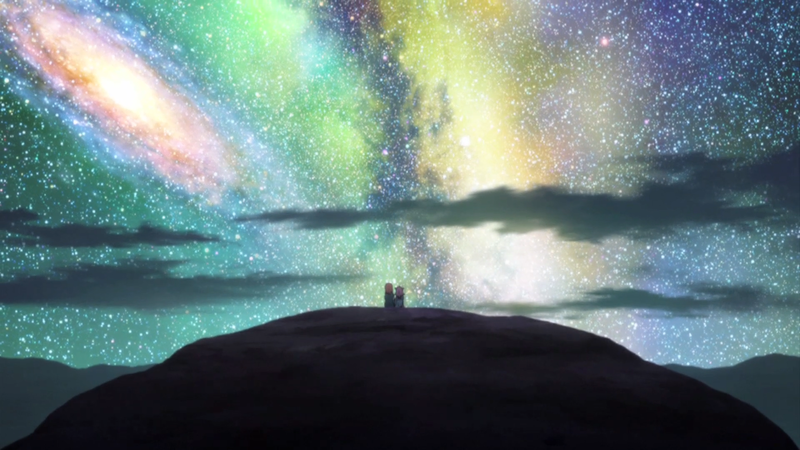 Since the show regularly takes place in the near and the far reaches of space, it is able to provide an array of backgrounds and anomalies that captivate. Beautiful explosions of color and dazzling arrangements of lights allow the audience to view the solar system, galaxy, and universe as if it were right in front of us. The same cannot be said for the character designs. Outside of each girl having a signature color – Subaru is pink, Aoi is blue, etc. – Nanako has the only notable design, with her lavender hair that covers half of her face to match the mysterious and cool demeanor she normally gives off. Actual animation is somewhere slightly above average. The show actually demonstrates a lot of movement due to the girls’ magical capabilities. Flying through the sky, the solar system, and the outer reaches of the galaxy, they dip, dive, and drive on their “brooms” to accomplish their goal for that day. Even when they are not defying the laws of physics, they manage to have facial, hair, and body reactions that keep the animation feeling fluid. As was briefly mentioned, Houkago no Pleiades has about seven notable characters that it works with. However, it makes a fatal error regularly when it does not do much with any them when they do receive some exploration. This tactic of inspection without impact is most often employed with the main cast, specifically Aoi, Nanako, Itsuki, and Hikaru. The season has each of these girls receiving an episode dedicated to expanding her person. Her background is revealed, her troubles she faced are shown, and her current contrast with her past self – in the present with the other girls – is highlighted to demonstrate the development she has undergone. 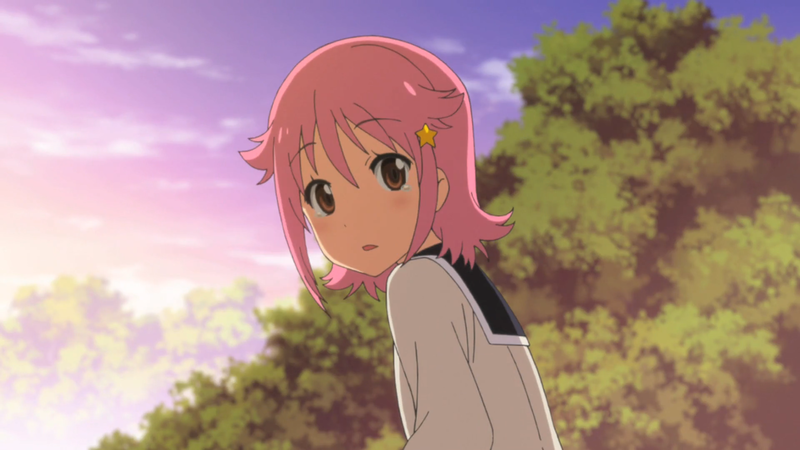 For example, Itsuki fell from a tree as a child, which caused her brother to get hurt emotionally. Therefore, she began being as selfless as possible, even if that meant going with the flow and foregoing what she wanted to do, because she wished to prevent others from receiving harm from her actions ever again. 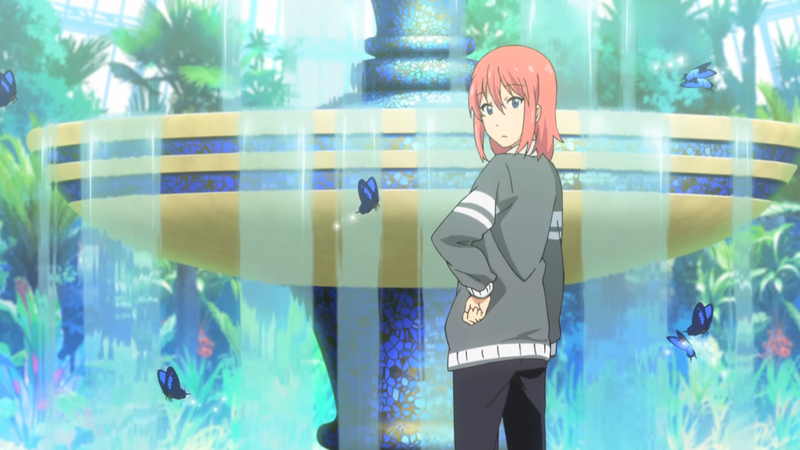 As a result, the audience witnesses as she gets “bold” (the anime’s words), she takes charge of the situation, and she ultimately discovers that it is okay to be a little selfish from time to time since friends and family will always be there regardless of what happens. Another example is Nanako, who had always been modeled as the odd-one-out, but it becomes more apparent when her past is revealed. As a child, her family split apart, resigning her to loneliness and a feeling of longing. Her loneliness is why she decided to take the three-month trip over everyone; she was already accustomed to being alone, thereby coming to the conclusion that she was best for the job. But that time, with nothing around her but the infinite blackness of space, allowed her to realize the friendships she had made, and that loneliness had left her light years ago. Aoi and Hikaru have the same process applied to them as well, giving what would appear to be a nice set of characters. However, while the characters get extreme focus, the problem is that it happens in one fell swoop. That is, after the girls, like Itsuki and Nanako, are looked at, they are subsequently never used again. Their “time to shine” has passed, and so has the anime’s attention for them. The other implication: they are given no attention before their one-time focus. The result ends up being long stretches of irrelevancy, with a single, highly relevant moment for the girls mixed somewhere throughout. Their characteristics are there and are used when appropriate, but the events before and after their special backgrounds are explained have almost zero impact, leaving much of the cast with a sense of uselessness during the entirety of the season. As for Subaru and Minato, their development is arguably even worse. Subaru acts as the supporter. She is not serious, strange, funny, or motherly like the other girls; she is the plain main lead. Her purpose, then, is to unite the group into one conglomerate, because even during the direst of moments, she remains her same, bubbly self. Unfortunately, her supportiveness keeps her on the sidelines right up to the end of the season, where she declares her drive to make Minato happy, which is more of the same. In essence, she comes off as wasted as the other characters because she is never seriously investigated. The opening theme is filled with guitar, but the singer and the beat do not seem to be on the same page. It is as if the song is trying to be more than what the singer is giving. Both parts work well separately, but they encounter disharmony when unified. The ending theme is composed with each of the girls in mind – considering the various vocalists – as a way to bolster its theme of togetherness. The piece itself is fine, but only the trailing “after school” has any power. Listening to the rest of the soundtrack, many pieces are whimsical in nature, such as “Hajimari no Melody,” to coincide with the floaty feel of the adventure. Other tracks, like “Engine no Kakera,” adopt weird sound effects whose alien tones fit the space atmosphere nicely. Some, like “Natsukashii Basho” and “Taiji,” demonstrate the OST’s ability to delve into soft and foreboding pieces, respectively. It is an alright collection of songs that fits the show well enough. Voice acting for Houkago no Pleiades is somewhere around average. No special shout-outs are to be had. When I think about this series, two main appeals come to mind: magical girls and space. The former does not cut it; the brooms are silly, the comedy is subpar, and the cuteness is minimal. The latter is not as lacking, with its talks on celestial bodies and light speed calculations. 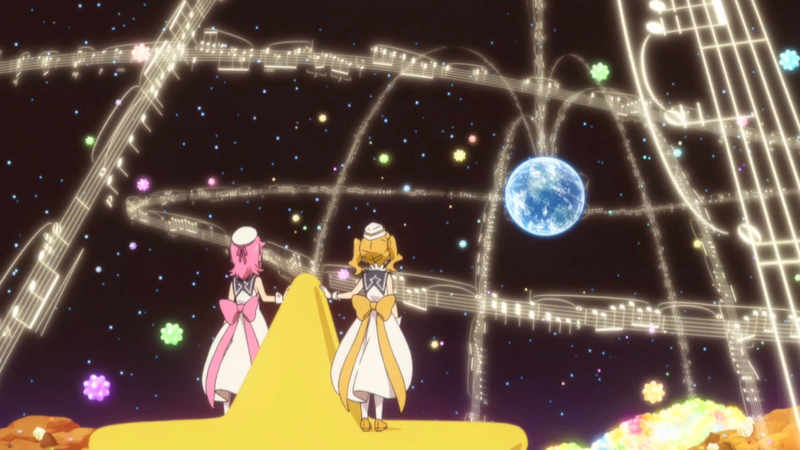 It is not super-scientific – hence the magical girls – but there is enough for space buffs to find entertainment in. Yet there are (coincidentally) two aspects that made it hard for me to even appreciate the information on space: Subaru and the ending. Subaru’s hyper happiness and insufferable inabilities were grating throughout the whole season. I thoroughly disliked her character quite early on when these facets of her personality became known. Combined with her never doing much besides being overly cheerful and her nonexistent development, she will be a character who I will not forget for the wrong reasons. Likewise, the ending is way too nonsensical. Not just in terms of the ideas already discussed, but because it invalidates the entirety of what happened. Everything, from the girls to the story, “starts over,” which left me incredulous. It felt like what I watched did not matter, since the anime appeared to think the same. Houkago no Pleiades is a massive failure of an anime. It has vibrant art and animation, but the broken narrative, botched characters, and boring music collapse upon itself, generating a black hole of nothingness which prevents not only light but almost anything worthwhile from escaping its clutches. No amount of wishing will change this one’s destiny. I’m impressed you got that much of a review out of this one. It looked cute at first, but after a while I just realized what a mess it was. I did finish it though, though I don’t know why. > …and we’re done here. Agreed; don’t watch this one now or ever! > It looked cute at first, but after a while I just realized what a mess it was. Yea, unfortunately it just never manages to do anything right with what it has. And even when it DID try to make things work, it came off as lazy or nonsensical, sometimes both. > I did finish it though, though I don’t know why.